Adopt steel tracks or .steel tracks and block rubber. The track motor can be fixed displacement or variable displacement concealed planetary gearbox and hydraulic motor, such as Nabtesco (Japen), Brevini (Italia). If you need, we can also provide track motor made by our own factory. The beam is made of Q345B with high loading capacity. It can also be designed and manufactured on customers' request. It is widely applied in all kinds of large drilling rig, excavator, paver, Aerial Working Platform and construction engineering machines. 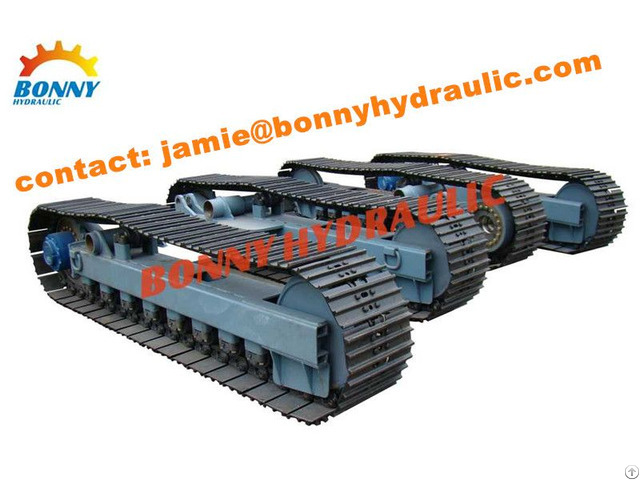 Business Description: This is Jamie from Bonny Hydraulics Transmission Co.,LTD, is an certified leading manufacturer, exporter and supplier of hydraulic motor, hydraulic winch, planetary gearbox and track undercarriage in China.